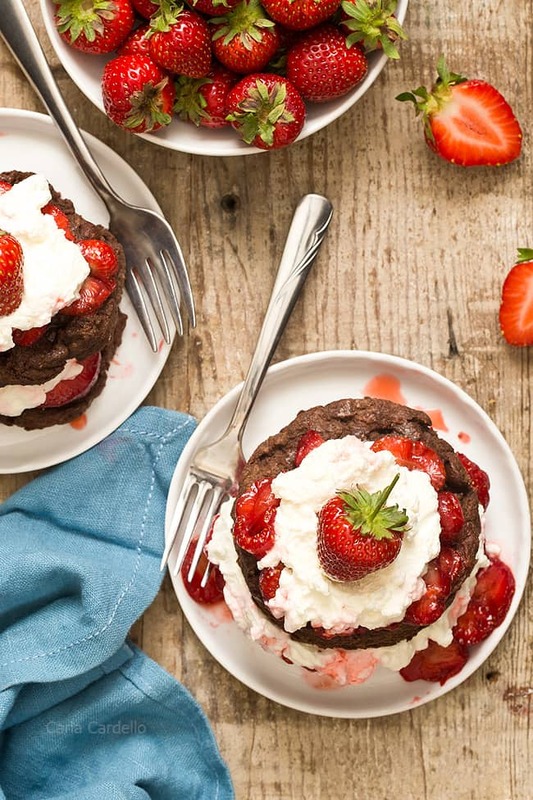 Just when you thought strawberry shortcake couldn’t get any better, it does with chocolate! 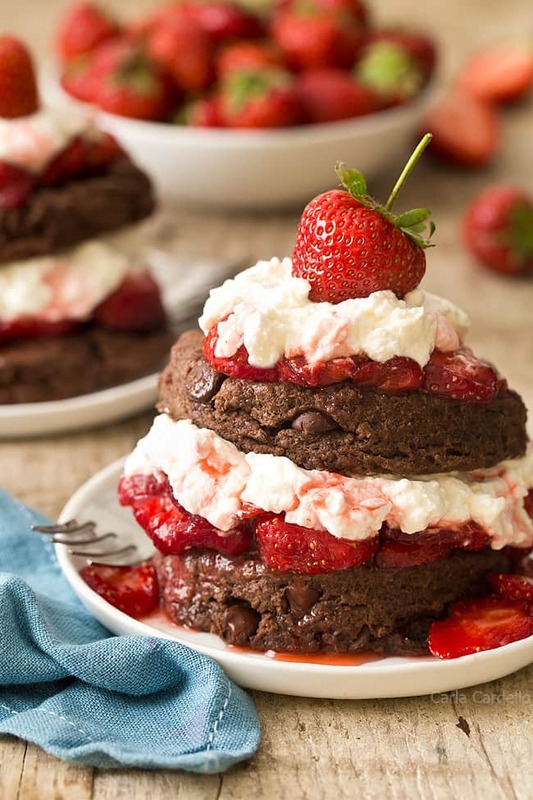 Learn how to make strawberry shortcake from scratch with Chocolate Strawberry Shortcake filled with fresh strawberries and homemade whipped cream. Because recipes are my life now, I have a never-ending list of ideas. I have a notepad with 12 columns of ideas plus random notes I write elsewhere – my planner, random scraps of paper, a mini notepad I use when I travel. Some recipes I’ll probably never make but thought they were a good idea at the time. Other recipes have a really cool title, but I have no clue where to begin creating it. I was sharing ideas with a friend when she asks “oh how will that work?” Too early to tell, friend. Too early to tell. I’ll never tackle the entire list, but it’s a start. 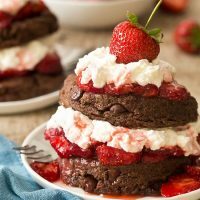 I’ve had an idea for this Chocolate Strawberry Shortcake recipe for several years now. What would happen if you added cocoa powder and chocolate chips to the biscuits? Pure bliss, that’s what happens. 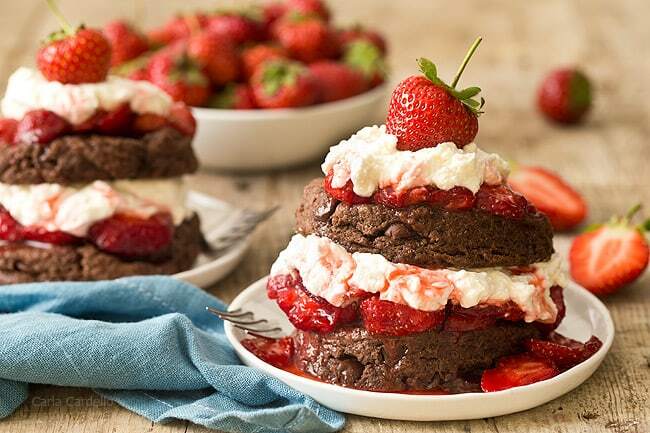 Since Strawberry Shortcake Day is coming up on June 14, I thought today would be the perfect opportunity to post about strawberry shortcake with chocolate. The best part is I figured out how to scale it down to make dessert for two. Which trust me – your waistline will thank you because you’ll want to eat all the chocolate biscuits. There are two ways you can make shortcake – with biscuits or with sponge cake. I wanted to go more traditional with biscuits, but if you’re looking for actual cake, check out my Strawberry Shortcake Layer Cake and my Strawberry Shortcake Cheesecake. To make strawberries for strawberry shortcake, you use a technique called macerating. Macerating means to soften food by soaking it in a liquid. In the case of these strawberries, you coat them in sugar, which brings out their natural juices. The strawberries then sit in these natural juices until they soften. You want to let them sit at least 30 minutes or so, but the longer they sit, the softer they’ll get. When you’re ready to serve, the juices act like a strawberry sauce for strawberry shortcake. Of course no strawberry shortcake is complete without making whipped cream from scratch. I toyed with the idea of also making chocolate whipped cream, but I liked the flavor and color contrast of regular whipped cream. If you’re feeling adventurous, go for all chocolate. In a large bowl, mix together the flour, cocoa powder, 2 tablespoons sugar, baking powder, and salt. With a pastry blender or your fingers, cut in the butter until the pieces are the size of small pebbles. Set aside 1 teaspoon heavy cream. Add the rest of the cream into the butter mixture and stir with a fork until a dough forms. Stir in the chocolate chips. Lightly knead the dough a few times in the bowl then place it on a lightly floured surface. Roll the dough out to 1-inch thick. Using a 3 inch round biscuit cutter, cut out two circles and place them on the baking sheet. If there are enough scraps, you can reshape into a smaller biscuit. Meanwhile, in a large bowl mix together the strawberries and remaining 1 tablespoon sugar. Let sit for at least 30 minutes or until juices form and berries soften. To serve, cut each biscuit in half horizontally. Top the bottom half strawberries and whipped cream then top with remaining biscuit half. 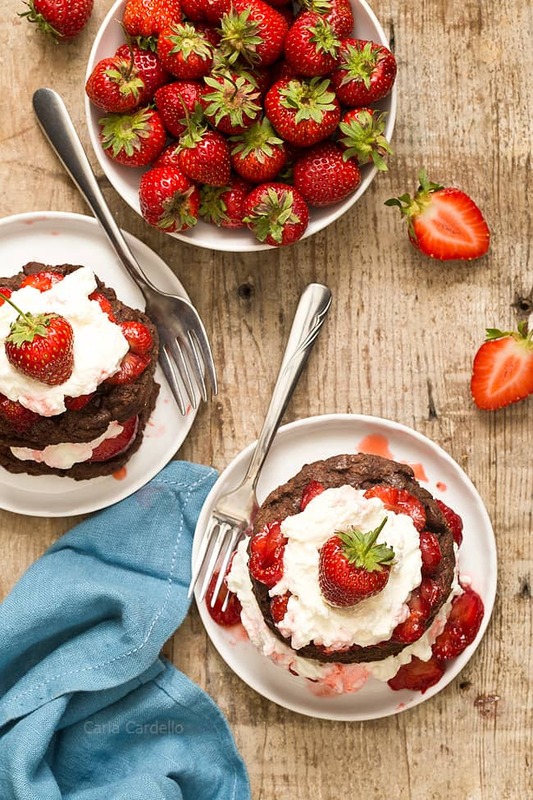 Drizzle with strawberry juices then serve immediately. Really love chocolate? Serve it with Homemade Chocolate Whipped Cream instead. Cuisine: American / Category: Crisps, Cobblers, Etc. Love the floral note the rose water adds. Glad you loved it! Changes I made: less sugar and added cocoa powder to whip cream. Used extra dark chocolate chip instead. Added strawberry compote to it. Pros: quick and easy. Chocolatey and delicious. Had enough for 3 and a smidge. Cons: was able to taste a little of the baking soda when eating it plain. Will use less next time. Overall it’s amazing, will make again. Love the idea of adding cocoa powder to the whipped cream! Can’t get enough chocolate, right? ;) As for the leavening agent, the recipe calls for baking powder, not soda. They aren’t interchangeable, so I’m guessing that’s why you tasted baking soda because there is no acid to react with the baking soda.